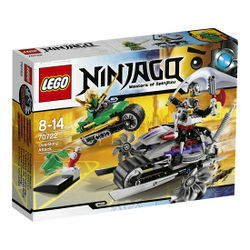 70722 OverBorg Attack is a Ninjago set released in December 1, 2013 in the US and Canada. The set features a bike for the OverBorg, a motorcycle for Lloyd, and a ramp with a trash can and fire hydrant. This is a description taken from LEGO.com. Please do not modify it. (visit this item's product page) Cyrus Borg has been transformed by technology into OverBorg, and is on a mission to control New Ninjago City and capture the Green Ninja. Help the Green Ninja escape to safety on his super-slick cycle with golden blades. The OverBorg has powered up in his mech chair and is giving chase on his all-terrain tank bike, churning up the road with the two fast-spinning, slicing circular saw blades. Evade the tank bike’s lasers then accelerate onto the ramp and soar over OverBorg’s fearsome machine! Includes 2 minifigures with weapons and accessories: OverBorg and Lloyd. This and 70725 Nindroid MechDragon are the only sets in Ninjago's 2014 wave not to include Techno Blades. Facts about "70722 OverBorg Attack"
This page was last edited on 2 November 2016, at 00:04.